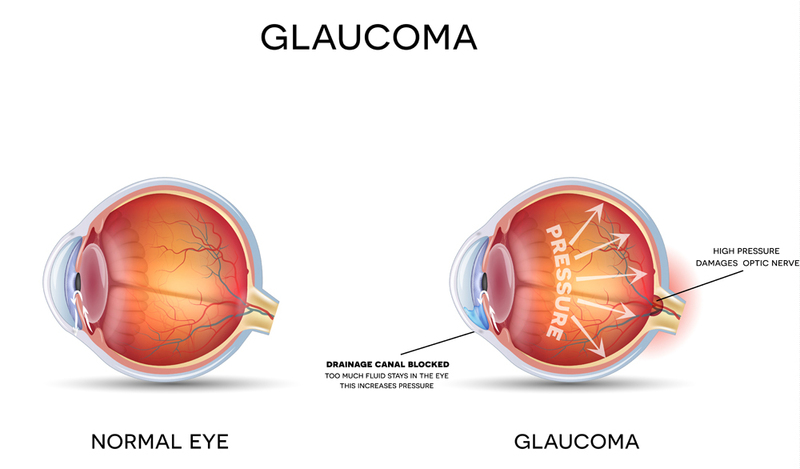 Glaucoma is a disease involving increased fluid pressure within the eye. Just like the body responds negatively to high blood pressure, the eyes also react adversely to high intraocular (within the eye) pressure. Your optic nerve is responsible for transmitting visual messages it receives from the retina to the brain, where these messages are interpreted as recognizable images. Deterioration of the optic nerve occurs if glaucoma progresses without treatment. Damage to the optic nerve due to glaucoma is irreversible. Any vision impairment caused by glaucoma is permanent. Because glaucoma is one of the most serious eye diseases, your optometrist in Stratford and Bridgeport urges everyone over 35 years old receive a glaucoma eye exam every year. People with chronic migraines, diabetes or circulatory problems are also at risk for glaucoma since these diseases impact eye blood vessel health and fluid retention. If your optometrist in Stratford and Bridgeport diagnoses you with glaucoma, it will likely be primary open-angle glaucoma. This form of glaucoma occurs when eye fluids do not drain out of the eye due to clogged or damaged eye ducts. Primary open-angle glaucoma happens slowly and without producing symptoms. In fact, you could have early onset of glaucoma and not experience symptoms for 20 years. Less commonly diagnosed than open-angle glaucoma, angle-closure glaucoma happens if the iris is positioned too close to the eye's drainage angle and blocks the drainage angle. When this angle is completely blocked, a pressure in the eye increases rapidly. Acute attacks of angle-closure glaucoma is an eye emergency requiring immediate treatment by your optometrist in Stratford and Bridgeport. Severe pain, blurry vision, headache and nausea/vomiting are signs of an acute attack of angle-closure glaucoma. Neglecting to get treatment for this type of glaucoma may result in partial or total blindness. Eye drops prescribed by your optometrist work well to lower intraocular pressure by inhibiting production of aqueous eye fluid. Other kinds of glaucoma eye drops facilitate the flow of fluids through drainage angles. When glaucoma eye drops do not reduce eye pressure enough to prevent optic nerve damage, your optometrist may recommend laser surgery called trabeculoplasty to make it easier for fluid to flow into drainage angles. A trabeculoplastyy is performed in-office or as outpatient surgery. In addition to providing glaucoma exams and treatment, Professional Eye Care Services also offers comprehensive eye and vision services and is a certified dry eye treatment facility. Schedule an eye exam today by calling our Bridgeport office at (203) 333-2020 or our Stratford office at (203) 377-2020.